To continue my Campbeltown mood after last Friday’s Campbeltown tasting (which included the W.i.p. 3 (no notes)) at my whisky club, I thought to give it a go with one of the latest releases. The Work In Progress yearly releases of 2013 contains of two versions, one a Bourbon wood and the other a Sherry Wood Matured version. I do own the Sherry Wood Matured so it was quite easy to select that one for a further review. It comes at an ABV of 46% Non Chill Filtered and not coloured. Nose: At thirst there is a lot of orange and honey present. After a while opening up to an array of delightful fruitiness covered with a sherried and honey sweetness (albeit rather lightly sherried). Picking up sultanas (duh), apples (the hot filling of a great apple pie) and mango. The nose is quite rich and buttery. A bit restraint and shy but nice to fiddle around with. Taste: A bit spicier then the nose. Again quite a big amount of honey and orange (now it turns more to the zest or marmalade). Next to the fruits as mentioned there is a distinct influence of wood spices. Picking up some ginger, cloves and cinnamon giving the dram a somewhat darker, warmer feel then the somewhat distinct nose. Finish: Evolving more and more to an oaky finish. Lots of wood. A bit burnt nuts, honeyed coated almonds and quite a distinct bitter orange, dark chocolate finish. I am certainly looking forward to the next release which will be on the market soon. 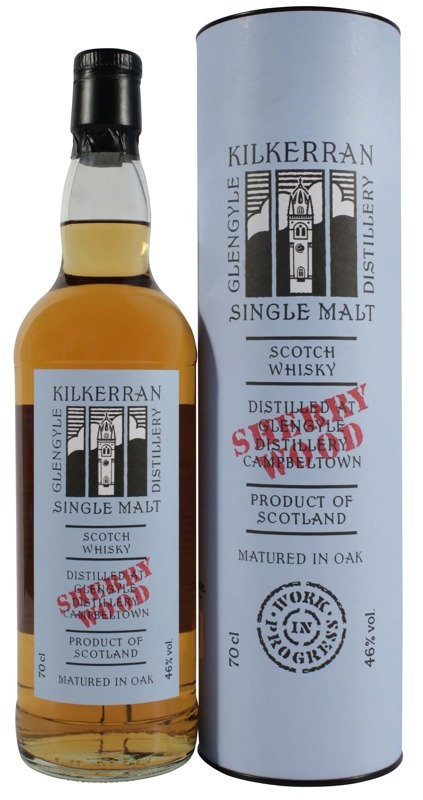 This entry was posted in Campbeltown notes, Kilkerran/Glengyle and tagged Glengyle, Kilkerran, Kilkerran review, Kilkerran Tasting note, Kilkerran Work In Progress 5 Sherry Wood, review, Sherry wood, Sherry wood matured, Tasting note, WIP 5, Work in Progress 5. Bookmark the permalink. Do you mean there w.i.p. 5?